and here is my first post…. so i figured i’d dive right in and not worry about making my first record the “be all end all” of my collection or anything….so i just picked up one that was near the top of my stack of newly aquired used 7″s and put it on hoping it was a decent one and it is. it also has turned out to be a great example of some unique (or at least common) characteristics surrounding JA pressed records…..that is finding definitive information about it is problematic at best….there is a fair amount of surface noise (although not too bad in this case), there is a slight warp to it (not too noticeable as well), and there is at least one pop/skip (near the beginning of side b(?))…. that ? 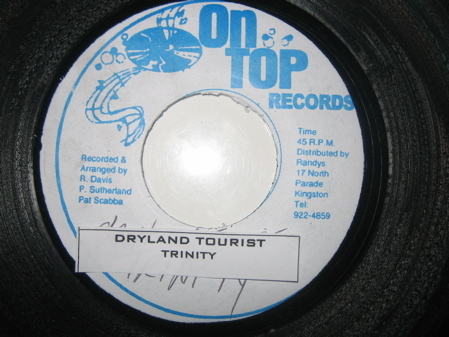 after side B brings me to my next point….so the only marker on this record is the glued on artist/title on the front there (Trinity- Dryland Tourist) and that side certainly is Trinity. The B side (or what I’m assuming is the B side) seems to be(is without a doubt…) a dub of that, with some of the original track vocals….doing a bit of snooping i’ve discovered that Trinity’s cut is a version/toasting of Ronnie Davis’ ‘Holding On’ and the only other copies of this record listed I’ve found list that as the A side and Trinity as the B side….is this mislabeled? is this some other version of this single? who knows…. (maybe you do? )…regardless…solid late 70s grooves here…. Not sure who did the dub but the Ronnie Davis version was mixed at King Tubby’s…so maybe tubby was at the controls?…sounds solid enough to be him.